There are a variety of cutting board options to choose from. Which do you have? Bamboo or wood, glass or plastic? Do you know which cutting board is a safer bet? Do you know which board is hard on your knives? Read below for our Cutting Board Buying and Kitchen Use Guide. Use a mix of liquid chlorine bleach and water (1 tablespoon liquid chlorine per gallon of water) and fill the sink. Soak your cutting boards in your sanitizing solution for a half hour. Rinse boards with clear water and air dry. Plastic is one of our last options for many reasons. While most may believe this is a sanitary option because you can wash it in the dishwasher, several studies have been done that have found more bacteria recovered from a used plastic surface as compared to a wood surface. One such study performed at the University of Michigan, found just that. Even though we believe we are disinfecting the plastic board, the plastic can be prone to knife scarring or impressions that make it nearly impossible to clean and disinfect manually. Plastic is our least favorite kind of cutting board. Many people believe that it is the most sanitary, especially as you can wash it in the dishwasher. However, a University of Michigan study found that “more bacteria are recovered from a used plastic surface than from a used wood surface.” The study also found that though a new plastic board could be disinfected, a knife-scarred plastic surface was impossible to clean and disinfect manually. We give our plastic boards a B- rating when it comes to using them for raw meats, poultry, fish and eggs. However, they are a fantastic option for cutting vegetables and fruits. Bamboo is our favorite surface of choice for cutting boards in our kitchens. It is a sustainable option. Chemicals are not needed to harvest the Bamboo. They absorb less liquid than wooding cutting boards and thus are believed by many to be more of a sanitary option. 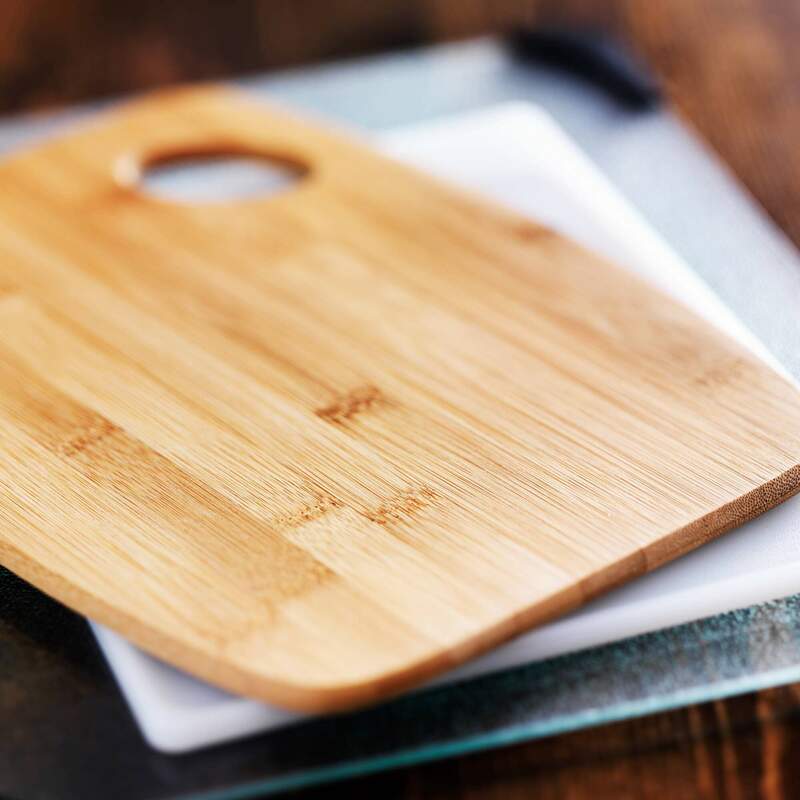 Before you run out and purchase a new Bamboo cutting board, you should know they are much harder than traditional maple cutting boards, so they tend to be harder on our knives than other types of wood boards. It does need some extra love an attention. You will need to oil your bamboo because it will splinter if it dries out. Wood cutting boards are among the most popular in home kitchens. Like bamboo, most boards require consistent oiling to prevent splintering and extra wear and tear. They are porous and softer than bamboo. The oiling helps keep the wood in good condition by creating a barrier against moisture. Since porous in nature, they will absorb everything and anything you put on them, including bacteria from raw foods. Wood is among the best surfaces for your knives. The wood won’t dull the blade. Glass cutting boards are nonporous and easy to clean — you can wash them in the sink or the dishwasher. However, glass cutting boards are the worst for your knives. For this reason we don’t recommend glass cutting boards. Prep right, prep safely and enjoy the deliciousness all food has to offer!